Rosemary essential oil has a strong, camphoraceous and herbaceous aroma. It is used as an analgesic, antidepressant, antiseptic, antispasmodic, astringent, digestive aid, diuretic and to treat hypertension. Rosemary essential oil may not be suitable for people with epilepsy or high blood pressure. Avoid in pregnancy since it is an emmenagogue (stimulate blood flow in the pelvic area and uterus; some stimulate to menstruation). 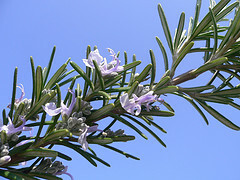 Rosemary essential oil is used in homeopathic remedies. Clears the head and aids memory, good for mental strain. Helps ease gout and tired, overworked muscles, tired or weak legs and circulatory problems of extremities, as well as cold feet. Since it stimulates blood circulation, it is a good remedy for low blood pressure. It is an excellent tonic for the liver and gall bladder. Known to help lower high blood sugar. Used in shampoo and hair treatments, it helps stimulate blood circulation to the scalp; thus, it is being beneficial for promoting hair growth. 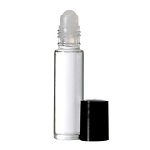 Blends well with lavender, basil, cedarwood, frankincense, ginger, grapefruit, orange, peppermint and bergamot.